On June 28, 1924, a bronze bust of Swedenborg, sculpted by the Swedish sculptor Adolf Jonsson, was given to the city of Chicago by Mr. and Mrs. L. Brackett Bishop. The ceremonial unveiling of the statue, on an island at the edge of Chicago's Lincoln Park, included a speech by Professor C.G. Wallenius; the reading of a letter from President Calvin Coolidge by Congressman Carl R. Chindblom; an address by Axel Wallenberg, Swedish Minister to the United States; and the reading of Edwin Markham's poem "Swedenborg." The statue was a reproduction of an earlier one completed by Adolf Jonsson, and was commissioned by Mr. and Mrs. L. Brackett of Chicago. When the statue had been completed, an information packet was circulated in the United States, and along with other information, listed some of Jonsson's sources for the sculpture; "among them the studies of Swedenborg's skull by Prof. W. Hultcranz, in Upsala; the large painting in the Castle of Gripsholm, ordered by the Council-President and Prime Minister Hopkin; and the painting in the Nordish Museum at Stockholm" (New Church Life 1923, 41). The statue remained in Lincoln Park until 1976, when it was stolen. The theft was reported in a February 10, 1976 article in the Chicago Tribune. "A Park District spokesman said the last bust burglary he recalled was that of a Beethoven bronze in the Lincoln Park Conservatory, stolen in April 1971. It never was recovered. 'I can't see why anyone would want that [Swedenborg] bust,' he said. But apparently Swedenborg wasn't the object of the haul. The metal alone is worth about $10,000, according to police" (Elaine Markoutsas, "Statue in Lincoln Park Disappears; Police Baffled," Chicago Tribune, Feb. 10, 1976, p. 3). "From Our Contemporaries: Denmark. Report of Rev. S. Chr. Bronniche, Copenhagen, to the General Convention: 'On invitation I visited first in March the recently formed New Church Society in Stockholm, where I preached and administered the Lord's Supper to the friends, remaining with them about a week. Perhaps I may here mention that in Stockholm I made a visit in the studio of a young artist, the sculptor Adolf Jonsson, who is reading the Writings of Swedenborg with interest, and has made a fine bust (as yet in clay) of Emanuel Swedenborgthe best one I have ever seen. (I enclose a photo reproduction.)'" (New Church Life 1917, 688). "Church News: Sweden.We learn from Nya Kyrkans Tidning (1921, p. 178) that the noted sculptor, Adolf Jonsson, of Stockholm, whose large statue of Emanuel Swedenborg was completed two years ago, has received a commission from Mrs. L. Brackett Bishop to reproduce the same in bronze; to be placed in the house of the New Church Society at Chicago. The Tidning expresses the hope that means may be found to secure a similar statue for the Swedish capital, to be set up preferably in Adolf Fredriks Square, South Stockholm, close to the place where the Heavenly Doctrine first descended to earth" (New Church Life 1922, 286). gave five years to the subject, using several models, among them the studies of Swedenborg's skull by Prof. W. Hultcranz, in Upsala; the large painting in the Castle of Gripsholm, ordered by the Council-President and Prime Minister Hopkin; and the painting in the Nordish Museum at Stockholm. It is typically Swedish in conception and execution. The bronze measures 44 inches in height and 33 inches in width. The plan calls for a granite pedestal with a bowl of flowing water, making in all a beautiful adornment for a public park. Mr. Jonsson has made other notable marble and bronze figures, among them the Russian Princess, Marie Pawlona; King Gustav V, in the Solemnity Hall of Freemasons at Stockholm; Hjalmar Branting, chief of Social Democrats; Consul Oscar Ekman, at Gothenburg; Prof. Svante Arrhenius, in the Swedish Academy of Sciences; Sven Hedin, the illustrious geographer; and numerous others. The bronze of Swedenborg, costing one thousand dollars, has been secured for America. When sufficient funds are contributed to erect the pedestal, it will be placed in some public park of an American city. "For the use of the half-tone, we are indebted to the Rev. F. S. Mayer, of Baltimore, Md., who brought the matter to our attention at the request of Mrs. L. Brackett Bishop, of Chicago" (New Church Life 1923, 4142). "Church News: Chicago, Ill.The ladies of Sharon Church had the pleasure of entertaining the ladies of the Immanuel Church, Glenview, on Saturday, May 24th, at the church building on Wayne Avenue. We were also glad to have with us on this occasion a few friends from the parishes of the Chicago Convention Society . . . Mrs. Pearse spoke for the Kenwood ladies, and Mrs. L. Brackett Bishop told us some very interesting incidents of her travels in the Far East, and also mentioned the fact that the bronze bust of Swedenborg, which is to be placed in Lincoln Park, Chicago, had been paid for by contributions from all the New Church societies in the world. Adolf Jonsson was the sculptor, and a photograph of the bust appeared in New Church Life for January, 1923" (New Church Life 1924, 436). "We are indebted to Chicago friends for copies of several local newspapers in the Swedish language, containing accounts of the elaborate ceremonies attending the unveiling of a bronze bust of Emanuel Swedenborg in that city on June 28th last. 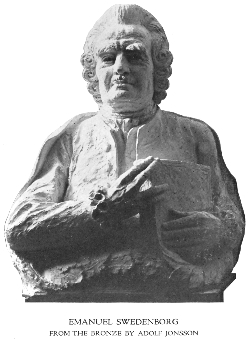 A photograph of this bust appeared as a frontispiece to New Church Life for January, 1923. As stated in the same number (p. 41), it is the work of Adolf Jonsson, a noted sculptor of Stockholm, and was purchased by Mr. and Mrs. L. Brackett Bishop, of Chicago, through whose generosity it now stands in Lincoln Park, one of the largest in Chicago's celebrated park system, where we find, among others, the notable, statues of Linnaeus, Beethoven, Schiller, and the St. Gaudens Lincoln. "The recent unveiling was held under the auspices of the Swedes of Chicago, and was given a national and international significance by the reading of a letter from President Coolidge, and by the presence of the Swedish Minister, Mr. Axel F. Wallenberg, who delivered an address. Except for the presence of Mr. and Mrs. Bishop, the New Church was not formally represented. On the shore of Lake Michigan, at the farthest point of a little island, connected by a bridge with beautiful Lincoln Park, the Swedes of Chicago, on June 28th, unveiled a bust of Emanuel Swedenborg, one of Mother Sveas greatest sons, under unusually festive circumstances. A more suitable place for a bronze statue can hardly be imagined. Surrounded by a restful greensward, it stands at a little distance from the great citycreation of menone of its pulsating arteries. Quite near the monument, the waves of the Lake break upon the beach, singing their everlasting song to the Creator of the universe. Swedenborg's memory has been honored, and the Swedes of Chicago have one more link in the common chain that binds them. Here we stand before the image of a man whose genius was so colossal and all-embracing that a right conception of him presents some difficulties. His lifework may be divided into two periods. During the first period, he chiefly presents himself as a great investigator and scientist, and during a later period of life he presents the picture of a supernatural prophet and seer. in a sonorous and brilliant Latin, which is considered by many to be the finest ever written on that theme. Atterbom, his most eminent eulogist, says that this work is of such imperishable poetic beauty, that if its contents were distributed among twelve poets, each of them would be elevated to the heaven of poesy as a star of the first magnitude. Swedenborg now stood at the height of his reputation and fame. He was respected by all, both high and low, was a member of the learned societies, and was considered the most eminent man of his century. A change took place in his mode of thinking, and in his work as an author, when he reached the age of fifty-seven years, which filled the learned of Europe with astonishment. From a great scientist, he became an equally great religious thinker, philosopher and seer. Religion, in its period of enlightenment, did not reach a higher plane than he. The spirit of his time has often been painted in its superficial sensuality, its wantonness, its sickly doubt, its proneness to scoff at everything profound. A marvelous contradiction to this spirit was Swedenborg. He had made himself the spokesman of a mystically religious and speculative doctrine, in which he claimed positive revelations from God Himself, from the angels, and from the spiritual world, hidden beyond the earthly sphere of mankind. At one stroke, he swept from his writing table all his previous works, and makes no reference whatever to them in his later writings. Thereafter, the only book he studied was the Holy Bible, which, in common with the Alexandrian School of former times, he interpreted allegorically. His doctrines were explained in a great number of works, which he published with great rapidity, one after the other, to the amazement of the enlightened, as we can well understand, and also to the great anxiety of the ecclesiastically orthodox of the old school. No one understood what had so suddenly affected the clear-sighted, many-sided, and honorable old man. Is he an instrument in the hands of the devil to introduce a new heresy? some asked. Others said: Is he a dreamer or a cheat, or has he entirely lost his reason? The last seemed the most probable, and was generally accepted. In a short eulogy, it is impossible for me to present with any completeness the many astonishing ideas and conceptions which flowed from his fertile brain. It is enough to say that he treated of a mass of religious subjects in a totally original manner. He never once appealed to any preceding theological author or commentator. The Word itself, and its interpretation, which he received from God and the angelic world, was sufficient for him. His Lord had clearly and plainly revealed to him that he was the angel who should come to stir up the water in the slumbering pool of Bethesda, that is, the dead Church, in order that it might again receive life and bring health to mankind. The quintessence of his teaching is found in his conception of God. He rediscovered the old principle of John, that God, in His inmost essence, is Love, and that He reveals Himself in Wisdom and intelligence. . . . I have tried as well as I could to outline an image of this great and noble thinker. Perchance I have not succeeded. In that case, pardon thou me, noble Swedenborg, if, on a day set apart to honor thy memory, I have lacked the power to sketch thy features in the light they deserve. If the power has been wanting, it certainly has not been for want of good will. Your invitation to participate in the dedication of a monument at Chicago, on the 28th instant, to the memory of Emanuel Swedenborg, the great Swedish scientist, author and theologian, whose name is borne by one of the earnest religious denominations of our time, has been received. As I explained to you when you called in regard to this matter, my duties at Washington will prevent my attendance upon this very worthy occasion. I desire, however, to express my deep interest in the work and life of this advanced scientist and thinker who was a pioneer two hundred years ago in much of the progress and advancement in mechanical, biological and medical science of the present day, and whose great learning and deep understanding of the mysteries of life was supplemented by the strong religious faith which has had devout followers many generations after the founders death. I beg to extend my compliments and good wishes to the people who will participate in the memorial to Emanuel Swedenborg. When Swedenborg struggled to solve the most complicated practical problems in anatomy, astronomy or mineralogy, his mind was always hunting for the solution of the mystery, for the unknown determining and guiding force in everything. When age came, and the problem of this life vanished for the problems of eternity, and when Swedenborg turned the last strength of his faculties to contemplation of the possibilities of things behind the veil, this inclination to seek in the realms of mystery entirely took possession of his mind, and gave his existence its final wonderful character. The other speakers have told you how Swedenborg's life was distinctly divided into one scientific part and one religious part. They have also told you how he became famous and admired as a scientist, and how he was considered as a lost genius by his contemporaries when be became exclusively religious. By this fact it is very interesting to state how difficult it is to judge the personalities with which one is connected in our own life time. We, children of the land where Swedenborg was born and developed, and which partly condemned him, stand today, with worthy men and women originating from other parts of the world, before Swedenborg's bust, erected through the efforts of admirers of Swedenborg, enthusiastic, not because of his role as scientist, but because of his religion, and because of the tremendous work he accomplished during his last thirty years, in trying to penetrate the mystery of the divinity and divine life within us. According to Swedenborg's own principles, he is in some form present here today. We will accept this, and bow our heads before Swedenborg's greatness, in the hope that that mark of deference will reach him. We acknowledge that most of us have, like Swedenborg, had some experience in life that served as a command to contemplate the subject of eternal life, but that few of us have seriously obeyed the command as Swedenborg did. We acknowledge that Swedenborg was great as a scientist, but still greater as our religious teacher, and we are proud to see his memory honored as such a teacher. But we are still prouder to see the great Swede installed among the memorialized of a great nation, a nation which knows of no boundaries when it comes to cultural and scientific developments, and which has accepted the theory that what is best on the globe shall become the characteristics of the American people. "It was hardly to be expected that those in charge of the proceedings should grant an opportunity for New Church 'propaganda.' Although the speakers were markedly deferential toward Swedenborg's religious teachings, the brief biography in the printed program features him as 'One of the Master Minds of Science,' and contains only this rather misleading reference to his theology: 'In his efforts to explain creation and existence, he was influenced by the mysticism of his age, which he had inculcated in childhood through his father. . . . He never left the Swedish State Church, however, and neither did he attempt to form a new religious sect.' Yet the publicity afforded by the occasion, and by the permanent memorial, is likely to be a means in Providence of leading persons to the New Church. Till lost in the immensity of God. The Time-veil of the husht Eternity. They called him "visionary clad in mist,"
And yet he stood earths iron realist. The deep interior love comes forth to rule. That binds the living ever to the dead. But in the Love that was our rest before. Which read the Truth upon the judgment page. Let out a gleam of Heaven upon the years! "The sculptor is prepared to deliver reproductions of his latest bust, including packing and freight to America, at the following prices: Plaster casts, $25.00; bronze casts, $100.00; executed in white marble, about $350.00. The approximate dimensions are: Height 15 inches, width 10 inches, profile depth 9 inches" (New Church Life 1929, 366367).